Byron is not the only black man to realize he has been force fed a badly bent set of “facts” about the Confederacy and Southern Heritage. Mr H. K. Edgerton, former president of the Asheville, NC NAACP, has been a vocal and tireless advocate of teaching the true history of the Confederacy, the circumstances, and conspiracies that led to the War between the States for nearly two decades. Edgerton marched from Asheville to Austin, Texas wearing a Confederate uniform and carrying a Confederate battle flag. These days, he mostly wears the attire and carries his flag at events that either commemorate fallen Confederate soldiers or to speaking engagements intended to educate about the real reasons that led to the war; States rights, imbalanced economic laws (Corwin Amendment), disproportionate allocations of Federal expenditures, and other political shenanigans. Edgerton cites historical documents, newspaper accounts, diaries, and other period literature to show that hundreds, perhaps thousands of blacks, both free and indentured, fought for the Confederacy voluntarily. Many didn’t or couldn’t enter battle, but instead worked to provide southern soldiers with food and equipment, also voluntarily. Edgerton’s main message is that southerners, even then, acted as one big family faced with annihilation by a foreign invader. 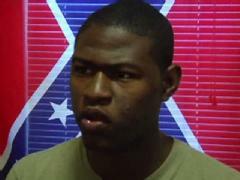 So what exactly is the purpose of the National (Federal) focus on portraying the Stars and Bars as a racist symbol? Are they afraid the South will indeed rise again? Or is it merely an easy and convenient means to distract us from the current political shenanigans? Before we take offense with each others’ beliefs or view points, before we denigrate someone’s sense of heritage, we need to make sure we have the security of a valid and viable culture. We are being distracted from the fact that each and every American has been put into debt by our Federal government to the tune of more than $5 Million each. That’s right, you are on the hook for more than $5 Million in loans somebody else (Congress) took out in you name. Before we belittle another person or group for their rhetoric, whether it’s the conservatives, liberals, Occupiers of Wall Street, the Tea Party, the NAACP, or the Fraternal Order of Police, we need to get control of our own governmental waste and its inherent greed. We cannot continue to allow the Controllers to shape our belief systems. We have a right and a duty to be informed in every aspect, including the true history of the War of Northern Aggression.